Terrific Tuesday - 14 weeks old!! One of these days I swear the boy is going to get grounded just for being biased to his therapist and running around and being a brat when I try to get him to identify his ling sounds.. I just need to wait till he understands what being grounded is. See how paranoid he made me??!! I suspected everything from myself to the device to the hours we put in to help him hear.. Everything..
And today at the speech therapy session, he DID hear all his lings well. And repeated too!! I L.O.V.E. our therapist. She is one of the best people we have met! She knows EXACTLY how to get Aarav to respond..
Today I truly felt like the therapy session is not just for Aarav's benefit, but for ours too!!! I was given a list last session of what all I need to get Aarav to practice. And the practice was not done as much as was required. I never realized this even with Kaustubh telling me the same time and again.. but now its about time to take a check .. Sigh. I just wish I would have realized this a bit sooner (or listened to Kaustubh instead of being all 'wifey'- I mean really listened and not just nodded) than waiting for a few weeks of play session loss. Its hard to earn back lost time.. Anyway. I now need to go back to having an hour long daily evening play sessions with Aarav to learn all our animal sounds and help Aarav being able to identify them well. I have the list and the schedule will start IMMEDIATELY. We spoke to our Audiologist today regarding Aarav's changes seen in his responses post-PSP and the new Neptune Map. She explained, whenever there are any mapping changes, the CI user needs some time to adjust to the new map, and in Aarav's case not just the map but the processor also changed!! So give him some time, she said..
That is probably why Aarav was not responding properly to being called in the first week after the change from PSP to Neptune! Now that he has adjusted to the new Neptune map he is back to responding to his name again!! 4 - Aarav and his BAbbling!! I also asked our Speech Therapist, about why Aarav keeps on repeating only BA at all times..
Aarav is now at the Babbling stage of speech development, wherein he is babbling a lot and exploring his own voice. And "Ba" is his very first syllable!! Kids sometimes get stuck on syllables for some time before progressing on to the next.. So when Aarav will learn a new syllable like Ma, Da etc, then he will repeat a lot of that new one..
That would be complete gibberish but a language of his own.. This will take time.. but the process has already started!! 5 - Water Play with the Neptune!! This Saturday, I set up an elaborate play tub with all of Aarav's toys and we played in the water WITH the Neptune on him. The photos are in the camera... waiting to be able to carve out time to upload them in the computer... very soon, very very soon I will have a post on that too..
6 - Trike riding in the building car park..
For the first time, Aarav was allowed to take his bike for a ride in the parking. He did want to be just like Daddy and take the trike on the main road but as I was present, only the car parking area was allowed. He rode around the parking for a few rounds..
After which he decided that the trike was parked and should not be moved. So we left it unprotected in the parking (!!!! 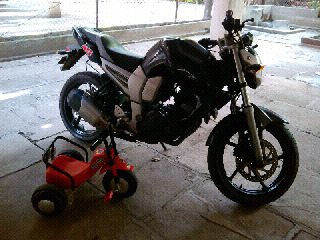 :-O ) and Aarav took me out for a walk..
Much to my relief, it remained in the parked spot when we were back !! !